I’m very pleased that our RE/MAX Commercial division at RE/MAX du Cartier remains at the forefront of commercial property and lease acquisitions in Montreal. 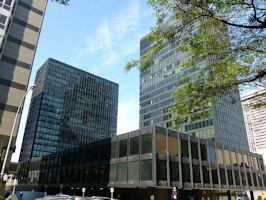 In addition to a string of very successful lease transactions on behalf of corporate tenant clients for office, industrial, as well as for retail and restaurant space in 2015, we have successfully represented the buying interests for the 328,558-square-foot office and retail complex at Westmount Square which has sold for $100 million CDN. I’m proud that our colleague Albert Sayegh led the acquisition process for purchaser Creccal Investments which bought the trophy asset from Elad Canada. Long-considered a landmark in our city, Westmount Square was designed in the early 1960’s by acclaimed architect Ludwig Mies van der Rohe and modeled on Chicago’s Lake Shore Drive Apartments. Along with Le Corbusier, Walter Gropius and Frank Lloyd Wright, Mies is widely regarded as one of the pioneers of modern architecture. This transaction underscores the strength of the RE/MAX Commercial international platform, as well as the depth of our Montreal capabilities in representing the demand interests in commercial real estate transactions, buyers and tenants, which require expertise to match the sophistication of landlords and real estate investment concerns. © 2015-2019 François Brosseau. Tous droits réservés.